In The End of Nature, Bill McKibben discusses the perils of climate change, and in Maybe One turns his attention to the related problem of population growth, and to a powerful but simple thing every parent can do to help: stop at one child. The book is deeply personal as the author recounts how he and his wife struggled with the desire to have a second child so their daughter would have a sibling. This is, in fact, the most prevalent motivation for having a second child, and it is driven by a widespread (incorrect) suspicion that only children are likely to be selfish, spoiled, and maladjusted. Moving seamlessly from the personal to the global, and weaving together statistics and anecdote and philosophy, McKibben dismantles the stereotypes of the supposed perils of only children, shows the consequences that await us if we continue to allow overpopulation growth rates. 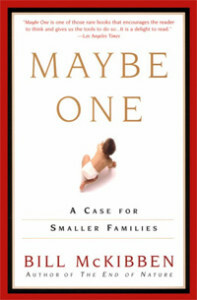 Beyond a parenthood book, it is a look at how our reproductive choices affect the larger population picture.